Jen-Ai Hospital International Patient Center (JAH IPC) is celebrating its 9th Anniversary this year, after opening its doors to accommodate the growing medical needs of the foreign communities in Taichung back in 2003. Most hospitals in Central Taiwan now provide English services to foreigners for an additional fee. However, JAH IPC provides free interpreting services in English and Japanese to ensure the safety of its patients. Since its launch of bilingual services in September 2003, Jen-Ai Hospital – Dali has had the distinction of creating the first “International Patient Center” and having the most number of international patients with different nationalities in all of Taiwan. IPC has also been quite fortunate to receive numerous local and international awards, as well as having several presentations accepted at various conferences and congresses around the world. 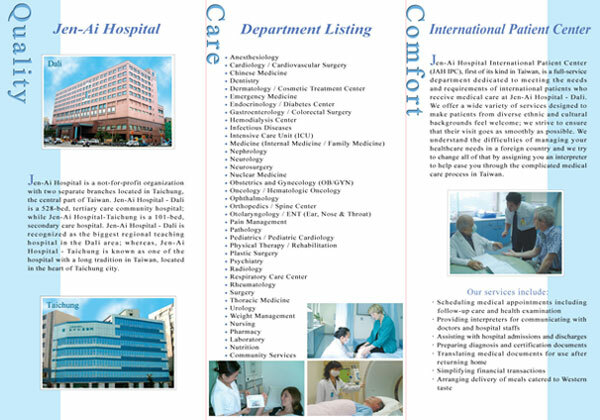 Jen-Ai Hospital International Patient Center has had over 18,500 international patient visits from more than 3,600 international patients with 93 different nationalities. The highest number of patient visits per month is currently at 350 visits, showing consistent growth over the years. Popular specialties among international patients include: Health Examination Center, Cardiology, Gastroenterology, Orthopedics, OB/GYN, Pediatrics, Surgery, Physical Therapy, Urology, Endocrinology, and many more. Hospital projects that were a first in Taiwan include: International Patient Center, Baby Web Nursery, Inpatient E-card Service, Bedside Terminal with Barcode Technology, Baby MMS & SMS (using mobile camera phone), Baby Video (using YouTube technology), and Baby e-File, just to name a few. What has been significant increase over the past year is the increase of “not-so-common” nationalities that come mainly from international students studying at local universities in Greater Taichung area. Historically, foreign students from National Chung Hsing University have been coming to Jen-Ai Hospital – Dali for medical services, due to its proximity. However, in recent years, after Taiwan’s opening up of exchange programs with other universities around the world, JAH IPC has seen a rising number of other Asian, Eastern European, Latin American and African students from Chung Hsing University, Asia University, Chaoyang University of Technology, Hsiuping Institute of Technology, Feng Chia University, Tung Hai University, Hung Kuang University, Providence University, etc. It is the hope of Jen-Ai Hospital – Dali that IPC will continue to serve the various medical needs of the growing foreign community in Taichung, as the city continues to internationalize itself in the future.